The Prophet Muhammad’s arbitration between the major clans of the Quraysh tribe during the renovation of the Ka’ba, when he was thirty-five years old carries great importance. The Quraysh wanted to rebuild the Ka’ba in 605 AD as it had been damaged by fire and flooding. During that time, news of a Byzantine ship running aground at the port of Shuaiba near Jeddah reached Makka. According to reports, the ship filled with marble, timber and iron for the repairs of a church in Abyssinia had been sent from Egypt to Abyssinia at the command of the Byzantine emperor. Qurayshi chief Walid ibn Mughira and others went to Shuaiba, and just as they purchased the timber from the ship, they also invited the ship’s carpenter and construction foreman, Baqu, to Makka to help repair the Ka’ba. 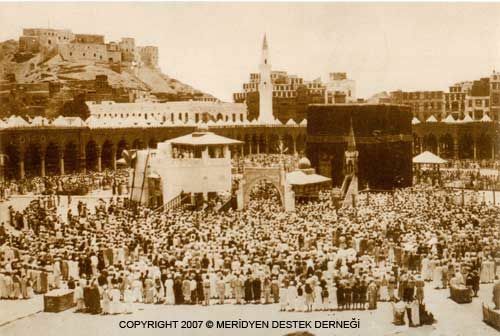 During the repairs, in which Muhammad worked alongside his uncle ‘Abbas carrying stones and assisting him, the Ka’ba was reconstructed; however, a dispute broke out as to the placement of the Black stone. No clan chief wanted to relinquish this great honor of reinserting the Black Stone to any other. There were even those who suggested fighting for the right. Eventually Abu Umayya ibn Mughira, a leader from among the Quraysh, suggested that all agree to the decision of the first person to enter from the Banu Shayba gate of the Ka’ba; the Quraysh agreed and awaited that person whose decision would be binding. When the people around saw that Muhammad entered through that gate they expressed their pleasure, saying, "There he is, Al-Amin (the Trustworthy), there is Muhammad". The future Prophet of Islam spread his mantle on a piece of cloth on the ground and, placing the Black Stone on it, invited the chiefs of the four major clans entrusted with repairing the Ka'ba to each take one corner of the cloth. When they raised the Black Stone to the spot where it was to be inserted, the Prophet took it and inserted it firmly in its position. As a result, potential clan war among the Quraysh was prevented. Please type '167' into this field.